Original Jamaican issue in mono. This first issue is a mispress, which includes an unlisted extended verion of Groovy Kind Of Love by Johnny Osbourne & Jennifer Lara, and omits Play It Cool by King Stitt. 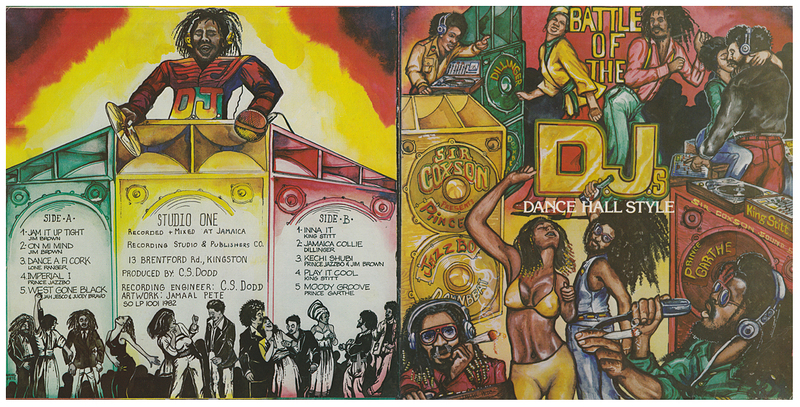 A 'live' studio album, intended to replicate a dance hall session - among those in the studio creating the live atmosphere are Jennifer Lara, Delroy Wilson, Earl 16 and Stranger Cole. Only two of the tracks included here were originally issued in 7" format (Imperial I and West Gone Black); others were only issued on album collections. Jam It Up Tight, On Mi Mind, Inna It, Kechi Shubi and Play It Cool are exclusive to this release. Inna It is credited to KIng Stitt but mainly features Jim Brown and Prince Jazzbo. All tracks have vocal introductions and background audience participation. The distinctive sleeve design is by Jamaal Pete.